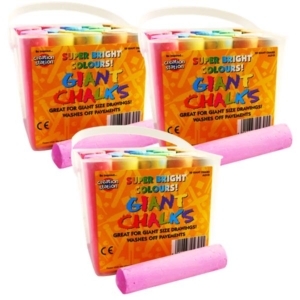 40 Jumbo Chalks White Playground Pavement. Ideal for little hands with the added bonus of being Washable and most importantly Non-Toxic. Suitable for use on Blackboards, Pavements, Metal and Stone. Chalks have a taper at one end to make them comfortable for little ones to grip. Supplied in a handy storage container. This item is also an ideal gift. 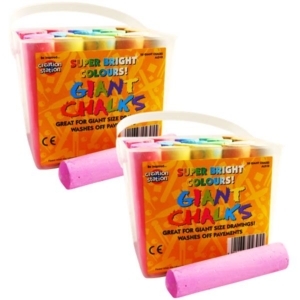 40 Jumbo Chalks White Playground Pavement. Ideal for little hands with the bonus of being Washable and Non-Toxic. Suitable for Blackboards, Pavements, Metal and Stone. Chalks taper at one end to make them comfortable for little ones to grip. Chalks are in a handy storage container. This item is also an ideal gift. Amazing Arts and Crafts Products are in use today throughout the world. They are in use in Nurseries, Daycare Centers, Clubs, Schools, and Colleges. They are also in use today with many home hobbyists from the Home Crafter through to professional Model Makers. Amazing Arts and Crafts products are also ideal for creating ideas for celebrations. Such as Birthdays, Anniversaries and Wedding parties as well as many other festive occasions.